Q&A with Rob Kettmann: How do I make my internal communications video look good? It might sound a little contradictory, but even as Reward Gateway’s blog manager, I know that not everyone loves the written word as much as I do. Trying to reach your workforce and get them excited about a new benefit, relay an important company update or introduce a new member of the leadership team can be done in print (or digitally), but in today’s fast-paced world, video is the perfect complement to other forms of content, especially for your internal communications. 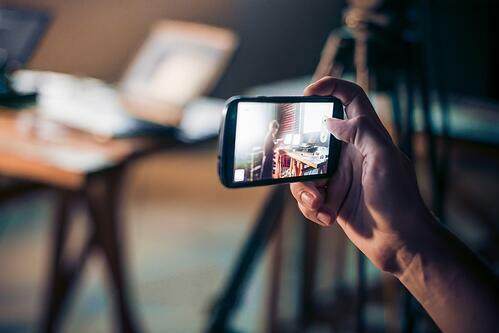 Using video can help showcase your best asset: Your people. But bad video, just like bad grammar, has no place in internal communications. We chatted with our own video expert, Video Production Manager Rob Kettmann, to learn the ins and outs of producing video, no matter how much experience you have, to create compelling footage. Reward Gateway: Sometimes corporate communications can be a bit stiff, or feel forced. How can you make it fun? Rob: In all that you do, your company culture should be showcased. To make a video more lively, involve your employees. People like seeing people that they know on camera, and it makes it more familiar (and interesting!) to them. You can make a video more fun and exciting with a few simple changes like adding fast-paced music. Lastly, always try to choose someone who’s comfortable being in front of the camera. You can capture the “Be Human” moments with someone who’s not afraid of a little ad-libbing! Reward Gateway: I’m sure you’ve cringed at some videos in the past. What are some mistakes you see amateur videographers make? Stop shooting in front of windows. People always think that background is important, and it is, but filming a person sitting in front of a window will usually create a dark silhouette or a super white background. Neither is pleasant to look at. Shoot with the speaker facing the window instead for some nice natural light. Also, try to avoid shooting under a harsh light (like fluorescents). Find some quiet! Shooting in noisy environments is a disaster, even if you don’t think there’s too much background noise. Your microphone will hear absolutely everything, so try to avoid shooting in a busy space. If you can’t get away from the noise, encourage your subject to get as close to the mic as possible and SPEAK UP. Use a tripod. It’s that simple. Nobody likes looking at shaky camera footage, and it will make your video look so much more professional. Reward Gateway: Not everyone loves being on camera, but sometimes it’s unavoidable. How do you deal with the camera shy folk? Rob: Before the camera starts running, start a conversation with them. A couple minutes in, turn on the camera and continue your conversation. Getting to know the person behind the camera will make them more comfortable in front of it and make it feel more like a one-on-one dialogue rather than the hundreds of people that will watch it later. 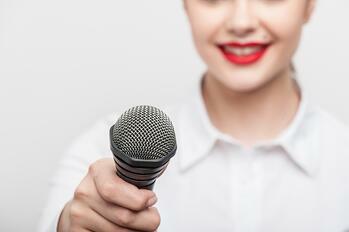 Reward Gateway: When it comes to animation vs. a live speaker, which should you go for? Rob: An announcement from a person is ALWAYS better than a recorded animation when it comes to personal company updates that impact a larger group of people. Animation should be used to show difficult subjects in an easy manner with graphs or on-screen examples. We typically use animation in our product videos, like below. Reward Gateway: Many companies don’t have a full-time videographer. How do you direct employees on taking their own “selfies” to submit video announcements? Reward Gateway: Do you always need a full video studio for production? Rob: Depending on how much you want to invest in video, you can scale up or down. For starters, you can make do with an iPhone, a microphone and a few softbox lights. The mic and lights you can buy on Amazon for under $200!